(Synopsis) When raven shifter Riley Porter was given sanctuary by the Phoenix Pack, she let them believe she had left her flock. Reluctant to divulge the secrets of her past, she was still embraced as family. Only Tao Lukas, the protective and passionate Head Enforcer of the pack, was resistant to the enigmatic shifter. Until Riley started to arouse in him something other than suspicion. 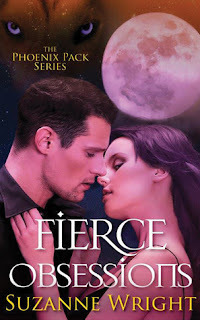 Suzanne Wright has added another awesome Phoenix Pack book to the series, and this one is one I've been wanting for awhile. Because scowly-faced, stoic Tao finally has fallen in love. And it was so much fun to read about. One of my favorite parts about this paranormal shifter world that Suzanne has create is that we're not just talking about wolves here. Although the series centers around a wolf shifter pack, the author has very cleverly and slowly woven other types of shifters into the mix. Not only are they there, but these other types of shifters are now falling in love with the wolves that we've known from day one. Riley entered the story a few books ago when we learned of the sanctuary that helps lone shifters of all types. She was a sort of surrogate mother to several of the shifter children there - namely a cheetah shifter boy and a viper shifter girl. When the Phoenix Pack took in the children, Riley came as a package deal. Riley is a raven shifter, and although not technically a lone shifter - she has a home flock and family - she hasn't lived with them for four years due to a rift with some of the other members of the flock. Tao has been dancing around Riley in his own way ever since her first saw her, and he has finally decided to make his move. As you can imagine, when Tao decides to act, nothing can deter him. Not even a stubborn, independent raven. When Riley has to return to her home for a family engagement, Tao goes with her. And it's a good thing too, because members of the flock are turning up dead, and Riley appears to be a link to the murders. Although it's clear she has a definite connection to Tao, I loved that Riley didn't automatically fall at his feet. Quite the opposite. She has no problem acknowledging their attraction and acting on it. But, she required a bit more from Tao before conceding to be his mate. She needed to trust him. To get to know him. And vice versa. I really like Riley and how strong she was. I loved how protective she was of the children and how she cared for them. Despite half the book taking place at Riley's flock, there was still plenty of time spent at the Phoenix Pack compound too. We saw all the pack members we know and love and got to see them interact together. It's really one of my favorite parts. Now with Tao paired up, one of the last ones I can't wait to see find a mate is Dominic. Hopefully his turn is coming soon!